There are many herbs around the world that can be used as natural home remedies for diabetes. They usually work by lowering blood sugar levels in a wide variety of ways. However, very few of these herbs will actually have a positive impact on the underlying causes for diabetes: insulin resistance and insufficient insulin production. They may also have side-effects just like drugs (although usually much less common or severe), and can cause hypoglycemia (below normal levels of blood sugar). 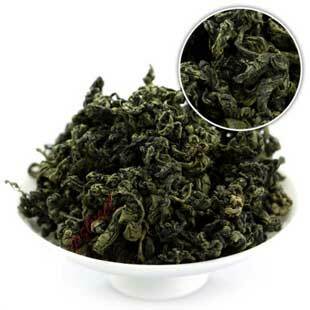 The Jiaogulan herb (Gynostemma pentaphyllum) is unique in many ways when compared to other herbs, especially anti-diabetic ones. It is not only one of the best home remedies for diabetes by helping to reduce blood glucose levels and fighting the root causes of diabetes, but it also has many additional benefits that are very important and valuable for anyone suffering from this daunting disease. There is strong evidence from human clinical trials that Jiaogulan lowers blood glucose and Hemoglobin A1c (HbA1c) levels by significantly improving the cells’ insulin sensitivity. 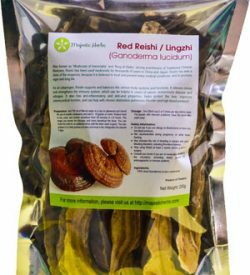 There is strong evidence from a number of animal studies that Jiaogulan is able to increase insulin concentrations in the blood both by stimulating the pancreas to produce more insulin and by improving sugar metabolism. Jiaogulan does NOT cause hypoglycemia. In other words, the herb has been shown to lower blood glucose levels ONLY if they are already too high. Jiaogulan was shown to protect the cardiovascular system, the liver and the kidneys from diabetic and non-diabetic damage. This is important for anyone, but especially for diabetics who are much more likely to suffer damage to these organs as a result of the disease. The herb will also lower cholesterol and blood fat levels if they are too high, and act to balance blood pressure. 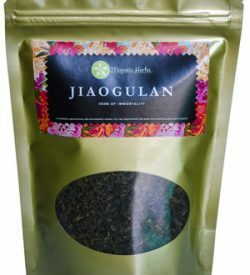 Jiaogulan will revitalize and energize the body and help with exercise, but without putting additional stress on the heart. This is important because diabetics can often experience prolonged periods of sometimes debilitating fatigue. Being a supreme adaptogen, Jiaogulan is effective in reducing and helping to manage stress, anxiety, and mood swings. There is some evidence that it can also alleviate depression. This is an important benefit because diabetics can often experience extreme levels of one or more of these conditions. Jiaogulan has a strong protective effect on the nerves and nervous system from damage, which adds a layer of defense against neuropathy. It will also help remove brain fog and improve concentration and memory. Certain chemicals in Jiaogulan have been shown to promote weight loss, which is particularly beneficial for diabetics. In this article I will only share with you the available scientific evidence directly related to diabetes (points 1-4 above). If you want to examine the studies supporting points 5-8, I invite you to take a look at our complete Benefits page. You can also join our mailing list and download our free e-book – Health, Balance and Wellbeing with the “Herb of Immortality”. We will also be adding more anti-diabetic herbs that we are very excited about, and will be notifying our subscribers when we do. So make sure you stay up-to-date not only on Jiaogulan, but other herbs that can make a big difference in your life. I discovered Jiaogulan while living abroad in Thailand, not long after my father was diagnosed with pre-diabetes 2 years ago. Like many people today, my dad wanted to avoid taking pharmaceutical drugs for as long as possible. Despite his doctor’s recommendation to start on Metformin, my father wanted to try a natural approach first. He knew that pharmaceutical drugs have many side-effects, can be potentially detrimental to overall health, are expensive, and that they are a one-way street – once you start taking them, it is usually for life. I wholeheartedly agreed with him, so I set out to find out if there were any home or herbal remedies that the Thai locals were using to fight diabetes. Thailand is a country where traditional and herbal medicine is widely practiced, and Thai people in general tend to use herbal remedies to treat a variety of diseases. I started asking around and soon enough came across a herb called Jiaogulan, or Gynostemma pentaphyllum, which is virtually unknown around the world, yet was very highly regarded by the locals. They called it the “Herb of Immortality”, because of its many health benefits and a folk legend that people who drink it on a regular basis tend to live to very old age and in excellent health. One of the claimed benefits was that it is successful in treating, and possibly even reversing diabetes. What I heard intrigued me and so I started to research this plant both on the Internet and in the scientific literature. I was surprised to find that there has been a lot of scientific interest and research on Gynostemma since its modern-day discovery over 40 years ago. This interest was mainly due to the fact that Jiaogulan contains the largest variety of a class of plant chemicals known as saponins of any other plant in the world. These saponins give many medicinal plants, like Ginseng for example, their therapeutic properties. However, while Panax ginseng (one of the richest in saponins plants) contains around 28 different saponins, Jiaogulan is known today to contain at least 174 of them – over 6 times as many! After 3 months of research and examining over 300 published scientific studies on the plant’s medicinal properties, I realized that Jiaogulan would be very beneficial to people suffering not only from diabetes, but a large number of other conditions and diseases. It became obvious that it is one of the healthiest, if not THE healthiest, plants on the planet. Convinced by my research, I was excited to find out whether Jiaogulan would have a positive effects on my father’s pre-diabetes. Up to that point he had been trying to manage his blood sugar levels using only cinnamon supplements, a healthy diet, and regular exercise. During that time (around 1 year) his fasting plasma glucose (FPG) level had remained more or less stable around 7 mmol/L, with spikes whenever he wasn’t being careful enough about his diet. So what happened once I mailed my dad a few packs and he started drinking Gynostemma tea daily? After only 3 months of drinking Jiaogulan tea, his FPG level dropped all the way down to around 5.2 mmol/L – a perfectly healthy level. And has remained in the normal range ever since, between 4.6 and 6.4 mmol/L – going up in the 6 mmol/L range when he eats too much food he’s not supposed to. Not only that, but he has been feeling amazing overall, a lot more energetic and positive, yet calm at the same time. The improvement has been so marked, in fact, that my entire family has started drinking Jiaogulan regularly, and everyone is feeling great!! Nowadays my dad doesn’t even check his glucose level more than a couple of times per week, because it has remained in a stable and safe range. For all intents and purposes his pre-diabetes is now under control (to the great surprise of his doctor), and my dad can do and eat more or less whatever he wants (within reason of course, he won’t eat a bunch of chocolate cakes). Why is Jiaogulan One of the Best Home Remedies for Diabetes? There are two root causes for the onset of diabetes: insufficient production of the hormone insulin by the pancreas, and/or the inability of cells in the body to use insulin properly (insulin resistance). Both lead to increased glucose levels in the blood. Over time, elevated concentrations of blood glucose result in damage to nerves and blood vessels, leading to complications such as heart disease, stroke, blindness, kidney failure, and lower-limb amputations. A number of human and animal studies show that Jiaogulan is able to significantly lower blood sugar and glycosylated hemoglobin (HbA1C) levels in a relatively short period of time, both as a standalone therapy and in combination with an anti-diabetic drug. Jiaogulan was also shown to reduce the 30 and 120-minute post-load values of an oral glucose tolerance test. The human studies concluded that Jiaogulan is mainly able to lower blood sugar by significantly improving the insulin sensitivity of the cells. Although not yet confirmed by human studies, there is much evidence from animal studies to suggest that Gynostemma is also able to increase blood insulin levels and to stimulate the pancreas to produce more insulin. In addition to directly attacking the underlying causes of diabetes, Jiaogulan has been shown to have strong protective effects on the cardiovascular system, the nervous system, the liver and kidneys from both diabetic and non-diabetic damage. Finally, there have been NO instances of hypoglycemia ever recorded in any Jiaogulan study. The herb has an effect on blood sugar ONLY IF levels are too high. So let’s take a look at the studies. In one human clinical study, patients with type 2 diabetes who had never previously taken anti-diabetic drugs were divided in 2 groups: a placebo and a Jiaogulan treatment group. The two groups did not differ in baseline characteristics and diabetic parameters, and all participants received the same diet and exercise therapies. The study took place over a 10-week period. For the first 4 weeks, one group was given Jiaogulan tea, while the other was given green tea as a placebo. This was followed by a 2 week break period. For the last 4 weeks of the study the treatments were reversed so that the initial Jiaogulan group was now given green tea, and the original green tea group was given Jiaogulan. 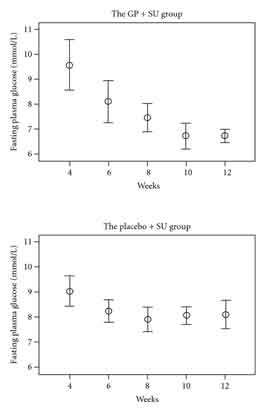 During the first 4 weeks, the Jiaogulan group saw a decrease in their fasting plasma glucose (FPG) levels from an average 8.2 mmol/L to 5.8 mmol/L, or an average drop of 2.4 mmol/L. Meanwhile, the green tea group saw a drop of only 0.2 mmol/L on average, and there were MUCH larger variations between individuals. When the treatments were reversed between the groups, the new Jiaogulan group saw a decrease in FPG from an average of 8.0 mmol/L to 6.6 mmol/L, or an average drop of 1.4 mmol/L, with all subjects in a tight range below 7 mmol/L, while the green tea group again saw a drop of only 0.2 mmol/L. Over the entire experiment, people taking Jiaogulan saw an average FPG drop of 1.9 mmol/L as a result of only 4 weeks of treatment, while those on green tea only dropped 0.2 mmol/L. It is important to make 2 observations here. First, that the FPG of the group initially on Jiaogulan remained lower by close to 1 mmol/L than their original values (prior to the start of the study) during the entire 10 weeks, even though they had only taken Jiaogulan during the first 4 weeks. This may suggest there was a lasting improvement in their condition. In a 12-week long study, patients with diabetes type 2 who had never previously taken anti-diabetic drugs were divided in 2 groups: a placebo and a Jiaogulan treatment group. The study measured fasting plasma glucose (FPG) levels and glycosylated hemoglobin (HbA1C). The study showed that the FPG of patients on the Jiaogulan treatment decreased an average of 3 mmol/L compared to a decrease of only 0.6 mmol/L in the placebo group. In addition, HbA1C dropped by 2% in the Jiaogulan group compared to 0.2% in the placebo group. In a 12-week long randomized, double-blind, placebo-controlled clinical trial, type 2 diabetes patients were divided into two groups: one treated with the anti-diabetic drug Gliclazide (sulfonylurea) and Jiaogulan, and another with Gliclazide and green tea as a placebo. During the first 4 weeks all patients were treated daily with a single dose of 30 mg Gliclazide only. They saw an average decrease in fasting plasma glucose (FPG) levels from 11.4 mmol/L to 9.3 mmol/L, while their HbA1C dropped 1% from 9.9% average to 8.9%. An increase in insulin levels was also observed. For the remaining 8 weeks of the study, the two groups continued on the same dosage of Gliclazide, with the addition of Jiaogulan in one group and green tea in the other. By the end of the study, the FPG of the Jiaogulan + Gliclazide group had decreased further by an average of 2.9 mmol/L compared to 0.9 mmol/L in the green tea + Gliclazide group. In addition, HbA1C in the Jiaogulan group dropped by an additional 2% compared to 0.7% in the green tea group. Therapy with Jiaogulan also reduced the 30 and 120-minute oral glucose tolerance test postload values by 1.8 mmol/L and 3.6 mmol/L respectively, while in the green tea group these values INCREASED by 1.2 mmol/L and 1.3 mmol/L respectively. Other improvements were also observed, but were not statistically significant. The researchers noted that using Gliclazide (sulfonylurea) with Jiaogulan gave similar results to a combiation therapy of Gliclazide and Metformin, but without any of the side-effects reported in those studies, which included diarrhea, nausea, epigastric discomfort, and anorexia. These results indicate that, when it comes to natural home remedies for diabetes, Jiaogulan is very beneficial to all diabetic patients, regardless of whether they choose a standard drug treatment or an all-natural one. All 3 studies examined above concluded that the lower FPG levels were due to an improvement in insulin sensitivity, which was at least partially due to the suppression of protein-tyrosine phosphatase non-receptor type 1 (PTP-1B) – an enzyme which plays a key role in insulin resistance. 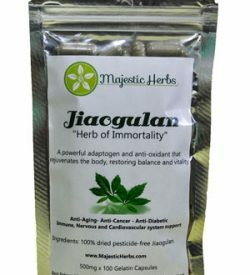 Jiaogulan has also been found to protect the heart and cardiovascular system of diabetic rats from diabetic damage, which is an important additional benefit.14, 15 Moreover, it was found to protect the liver, to inhibit weight gain, and reduce blood fat levels of type 2 diabetic rats with non-alcoholic fatty liver disease.17. While the results from these studies are already very encouraging, please keep in mind that the longest human study duration was of only 12 weeks. Taking Jiaogulan on a daily basis for longer periods is very likely to give even better results. Jiaogulan has NO negative side effects aside from rare cases of temporary nausea. 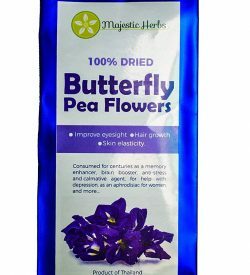 It has been repeatedly shown to be completely non-toxic and safe for long-term use. It does not cause hypoglycemia (below normal blood glucose level), because it is an adaptogen that has a strong balancing effect on the body. It will act to lower blood glucose only if your level is above normal. 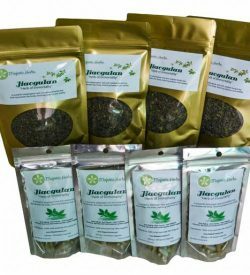 In addition to attacking diabetes on multiple levels, protecting your body from diabetic damage, and increasing your energy levels, Jiaogulan is VERY beneficial to ALL aspects of your health, including the cardiovascular system, brain and nervous system, liver, kidneys, immune function, lungs, and skin. It was also found to have strong anti-cancer, anti-aging, anti-stress, and anti-anxiety effects, to promote weight loss, to balance blood pressure and cholesterol, help with depression, and more. Jiaogulan is inexpensive – a single pack is usually enough for one month of daily usage. However, if you are a diabetic and want to see quicker results, the dosage/concentration should be increased. In that case, 3 packs of tea should be sufficient for 2 months of use. That still adds up to less than $30 per month. Using Gynostemma is as easy as brewing a tea that is pleasant and mild, in taste similar to that of green tea. Life for a diabetic is already difficult enough and we want to make it easier, not harder! Huyen VT, Phan DV, Thang P, Hoa NK, Ostenson CG; Gynostemma pentaphyllum Tea Improves Insulin Sensitivity in Type 2 Diabetic Patients; Journal of Nutrition and Metabolism; 2013;2013:765383. doi: 10.1155/2013/765383. Epub 2013 Jan 31. Huyen VT, Phan DV, Thang P, Hoa NK, Ostenson CG; Antidiabetic effect of Gynostemma pentaphyllum tea in randomly assigned type 2 diabetic patients; Hormone and Metabolic Research; 2010 May;42(5):353-7. doi: 10.1055/s-0030-1248298. Epub 2010 Mar 8. Yeo J, Kang YJ, Jeon SM, Jung UJ, Lee MK, Song H, Choi MS; Potential hypoglycemic effect of an ethanol extract of Gynostemma pentaphyllum in C57BL/KsJ-db/db mice; Journal of Medicinal Food; 2008 Dec;11(4):709-16. doi: 10.1089/jmf.2007.0148. Zhang HJ, Ji BP, Chen G, Zhou F, Luo YC, Yu HQ, Gao FY, Zhang ZP, Li HY; A combination of grape seed-derived procyanidins and gypenosides alleviates insulin resistance in mice and HepG2 cells; Journal of Food Science; 2009 Jan-Feb;74(1):H1-7. doi: 10.1111/j.1750-3841.2008.00976.x. Yassin K, Huyen VTT, Hoa KN, Östenson CG. Herbal Extract of Gynostemma Pentaphyllum Decreases Hepatic Glucose Output in Type 2 Diabetic Goto-Kakizaki Rats; International Journal of Biomedical Science. 2011;7(2):131-136. Waranya Keapai, Sopida Apichai, Narissara Lailerd, Anchalee Pongchaidecha; Attenuation of Hyperglycemia and Hyperlipidemia in High Fat Diet and Streptozotocin Induced Diabetic Rats by Aqueous Extract of Gynostemma pentaphyllum; 12th Graduate Research Conference, Khon Kaen University, Thailand; 2011. Hoa NK, Norberg A, Sillard R, Van Phan D, Thuan ND, Dzung DT, Jörnvall H, Ostenson CG; The possible mechanisms by which phanoside stimulates insulin secretion from rat islets; The Journal of Endocrinology; 2007 Feb;192(2):389-94. Ge M, Ma S, Tao L, Guan S; The effect of gypenosides on cardiac function and expression of cytoskeletal genes of myocardium in diabetic cardiomyopathy rats; American Journal of Chinese Medicine; 2009;37(6):1059-68.